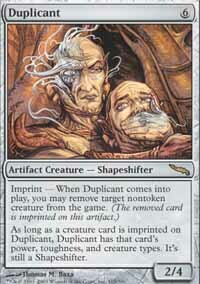 card text: Imprint - When Duplicant comes into play, you may remove target nontoken creature from the game. (The removed card is imprinted on this artifact.) As long as a creature card is imprinted on Duplicant, Duplicant has that card's power, toughness, and creature types. It's still a Shapeshifter. t me if i'm w ..